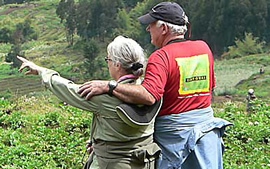 After your breakfast at your hotel, you will be picked and transferred to Gisenyi which is the largest port on L. Kivu. A boat cruise of Africa’s highest lake will reward you with captivating views of islands and far sights of the Nyiragongo volcano. Have lunch there and proceed to cross the border with Congo to the town of Goma which is the capital of the North Kivu province. Overnight in Goma. In the morning, you will pack your bags and get ready to hike one of the most active and violent volcanoes on the Continent with the world’s most fluid and largest lava lake. 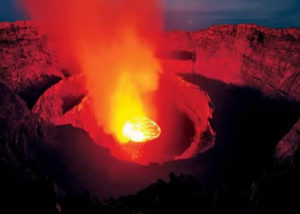 Nyiragongo Volcano is located in the east of DRC, around 19 km from Goma, and is the most active volcano in the world. In 1997 and 2002, flows of very liquid lava broke out from cracks in the volcanic slopes as lava flowed at a terrific speed killing scores of people and displacing hundreds of thousands in the town of Goma. The 4-5 hour hike through lush rainforest will climax with a fascinating view of this lava lake as you chill out for a night at the crater rim. Overnight in tents at the top of the volcano. After breakfast, start your descent for a transfer back to Gisenyi where you will later transfer to Kigali for an overnight or a late flight back home.